The two belligerent frères enemies dictatorial regime of Melese Zenawie and Isasias Afwerki started their war game that kept them in power for the last two decades. May is the month of the anniversary of their accession to power in the horn of Africa creating some of the most horrendous regimes of our time. 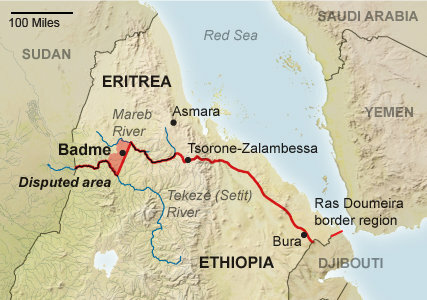 Starting May 27, 2012 at about 21:00PM up unto today midday 28 of May 28, 2012 conflict broke at the border city of Badme Between Eritrean and Ethiopian Forces. This may rekindle Eritrean-Ethiopian war of 1998 to 2000, which cost between 70,000 and 100,000 lives. There are some killed and wounded on both sides. The linchpin of the conflict was the small town of Badme. The later was attributed by Allegers agreement between the two dictatorial regimes to Eritrea but still under Ethiopian control. The eponymous plain around the town is “relatively useless borderland” between boundary rivers, the Mareb in the north and the Setit in the south. We remember on March 15, 2012, Ethiopia sent troops crossed the Eritrean border to attack three bases of the Afar Revolutionary Democratic Unity Front, allegedly in retaliation for the group’s attacks on a tourist party inside Ethiopia. The last war was not only underreported the same as today’s conflict.